Today was another laid back day. I was in a bad mood most of the day and I really couldn't figure it out until I talked to a friend late in the afternoon. It was about Halloween. It was about trick or treating. It was about the fact that Makenzie would not be running around eating candy. I do not dwell on these things often and was not today either but in my subconscience it was there. It took the saftey of my friend for these feelings to come out. For me to realize that I was sad that Makenzie could not wear the princess dress that has been in her closet since before her accident. That she really doesn't care about Halloween. In that moment of honesty I was mad that she was broken. I could not see past what the world says. I wanted different. I wanted to put her in her pretty dress, do her hair up with glitter and stand in front of the mirror with my 4 year old and put makeup all over her beautiful little face. I do not see Makenzie as broken and I love her to pieces but on days like this it is still hard. I also get anxious about being able to do what the boys want to to do while including Makenzie. It is COLD here! Makenzie does not do well in the cold! Trick or treating is outside.... after dark... brrrrrrr. Needless to say all of my worrying was for not. We had a GREAT time!!! I bundled Makenzie up in like 4 layers, put her in her chair and off we went! The boys got more candy then they know what to do with and Makenzie giggled the whole time watching them run up and down the driveways. She also loved all of the decorations everyones houses! Makenzie is SOOOOOO far from broken! She is such a joy and had just as much fun as all of the other kids just minus the candy! Our route for the last couple of years has been leaving from our house and trick or treating to Makenzie's PT's house. We stop and get warm, and then we load up in their car and hitch a ride back home! It has worked out soooo great! Thank you P and B!!! This year we stayed a bit longer. The boys sorted their candy while Mommy enjoyed some adult time and wine! GREAT times!!! Makenzie did great! Up much past her bed time she was still happy! I would not change this night for anything! God is so good! He is always there and even though I am human and get down sometimes he picks me up and sets me back on the right path again! I am so filled with love and joy for all of my kids tonight... just the way they are! I am also so thankful for friends that love me enough to truly listen to my thoughts with out judging me. That understand that this road is a constant roller coater of emotion. Friends that help get me back on track. Friends that can point out to me in times like today why the things the world hold as important, really don't matter at all. Makenzie is happy, healthy, and has one of the purest souls you will ever meet! She is one of four of God's most precious gifts to me. At the end of the day nothing else matters! All of the hard work is worth it and I wouldn't miss a second of it for anything in the world... other then maybe a glass of wine, good friends, without kids every once in a while! Sorry for the lack of pictures as I forgot my camera! Oops!!! I am going to go up and crawl in my warm bed and snuggle with my perfect princess! Hoping that she will sleep well and sleep in!!! All day today I have felt like it was Saturday. Today was a really good day. We did some relaxing, eating, standing, and skating. We had a birthday party today at the skating rink. Makenzie just loves to watch kids. It is amazing to me how much better she does with the noise. She was not to keen on eating there. I kinda knew that before we even tried but I wanted to see what would happen. She got in about 7 bites and then I conceded! Oh well! The boys got to make a snow fort at my moms house and Makenzie and I got to sleep in and play hooky from therapy. Sorry Christa. It really was not on purpose but Makenzie woke up about 2 am and tried to go to the bathroom. Now that she is eating her schedule in that department is a bit out of whack and has become a little harder. I changed her diaper and gave her some poop medicine which sometimes makes her puke. Sure enough she refluxed for about 10 min and out it came. I had to get the medicine in her because I don't want her to get constipated, have a tummy ache and think that it hurts to eat. She finally went back to sleep about 4 am. Needless to say by the morning the medicine had worked. However the boys were at my moms. The house was quiet, and we slept in. I couldn't believe it was almost 10am when I looked at the clock! That doesn't happen very often! OK like EVER! I am hoping it warms up enough to melt the snow off of the roads so that we can go trick or treating tomorrow! I have to be able to push Makenzie's chair! Kinda hard to do if there is still snow on the sidewalks and road! I'll let you know how that goes! I have 3 little boys sleeping on the couch. Grandma must have worn then out this weekend! Time to go carry them up the stairs and into bed! Thanks for all the thoughts and prayers! Believe! It is cold, wet, and I am stir crazy!!!! It finally stopped snowing about 10pm! I have watched many get stuck on my street and I now have 22 hours to get my walks shoveled! I hope it warms quickly in the morning so I am not shoveling ice! Makenie is supposed to have PT in the morning but I am not sure if we will venture out for that! It is not so much the roads as it is the cold! Makenzie doesn't do well in the cold as it causes her whole body to be very tight. She was also supposed to have her tube changed tomorrow afternoon but because of the strep that has been floating around here I cancelled that earlier this week. I will have to reschedule that as much as I don't want to! I hate to put her under!!! It was a long morning as it was cold and we were all stuck inside! The boys went outside for a bit but that was short lived. Into the house came the snow all over the floors and then there was the pile wet clothes! Oh the joys! It is so much fun to play in the snow but it was even a bit cold for that this morning. Makenzie had a good day! She ate really well. In total she got down about 4.5 oz! A little better every day!!! she also found out today that rolling off of mommies lap and onto the floor standing up next to the couch is a ton of fun!!!. We did this over and over! She just laughed and smiled! So proud! I am reminded often, how hard life is for so many. I wish that it was easier! I am truly grateful for all of the blessings that God has given me and that all of my needs have been met and that my outlook on life, although very different then most I know, is positive! Even though my dreams were not that of therapy, doctors, specialists, modified vans, feeding tubes, and prescriptions, life is good ! I have 4kids! I have my hands full and I like it that way. There are not enough hours in the day but that is ok! My house isn't always sparkling clean because we live in it..who cares. I am not a perfect mom, is anyone? I do the best that I can. I know a lot of people in the same boat. I ask tonight for prayers for rest and peace! I ask for prayers especially for a close friend of mine who has had her world turned upside down in the last 2 months! Life is hard! Life is good! We need each other! Pray! Where to even start! It has been a crazy couple of days! Sunday Zach cut open his finger. Monday he got stiches. Tuesday we were back to the doctor after he compained of a sore throat and a headache to confirm what this mommy already knew... he had strep throat. Then off to pick up a friend to have some much needed girl time. After dinner, and most of a game of LIFE it was time to put the kids to bed and get on with the Girl Night. Yeah right!!!! Nice try! Nope Zach's finger looked bad and on the advise of the pediatritian we were off to the ER at 9:30pm! Ok so that is not such an easy task when you have 3 other kids sleeping one of which is attached to a feeding pump and will not sleep anywhere other then her bed! Oh did I mention is was freezing cold and snowing! First phone call.... grandma... can you come and watch the kids? Yep be there in 30 min....wait is is snowing...make that a bit longer. Second phone call PT...can you come sit with my sleeping kids so that I can get Zach to the ER because the doctor said he could loose his finger.... sure be right there! 10 minutes later off we go in the snow. Now don't forget this is my girls night.... uh huh...Girls night at the hospital in the ER!!!! 2 hours later we are home. Zach still has his finger and we are watching it very closley. GEEZ!! I had an appointment at 9am this morning so I got to leave again in the snow. On the way home I picked up frozen pumpkins for the boys to carve. I came home to boys bouncing off the walls, Makenzie doing PT, my mom folding laundry, my dad shoveling the walks...yes, still snowing... my grandma cleaning the kitchen, my grandpa fixing the light fixture, and frozen pumpkins that the boys insisted we carve RIGHT NOW! I think I am developing a sensory disorder because at one point I just had to scream... JUST STOP!!!! However, my kitchen is clean, well was, my laundry is done, the walked WERE shoveled and my sons light is fixed! THANK YOU GOD FOR MY FAMILY!!! After convinsing my boys that carving frozen pumkins would be really hard, they left me alone for a bit to decompress from the previous bout of sensory overload. We made it through the pupmkin carving and they look great. I think my arm is going to fall off from scraping all of the guts out but the boys had a great time!! Makenzie ate 3 times today. Once during OT... oh yeah that happened this morning to... and two times this afternoon. She got down almost 4 ounces!!! HUGE! She is opening her mouth for every bite and her swallow is getting so quick! She is also closing her lips really well and keeping most of the food in her mouth! This is a huge improvemnt from even a weeks ago! I was able to speek to her old OT yesterday and she said she would LOVE to start working with Makenzie again! I am so excited!!!! Now I am just waiting on a time and billing details and we are on our way!!! God is so good!!! I believe that God lead us to Costa Rica, I believe God provided the means, I believe that God is allowing the Stem Cells to work in Makenzie! Thank You Jesus! One of the first things, other then the initial tone reduction and core strength we have also seen in Makenzie, my friend Jodie saw after taking her little boy, Charlie to Costa Rica was gut healing and eating...hmmmmmm....2 of the first things we have seen. To God be all the Glory! Stem Cells left in the umbilical cord are no accident! I have been contacted by another family about going back to Costa Rica with them for their sons first treatment, in Febuary. I would LOVE to do that! If that is in God's plan, he will provide again!!!! Please pray over this! Now that I have exhausted you with the crazyness of the last couple days of my life I am off to scrub the pumpkin guts off of nearly every surface of my kitchen. Have a great day! Believe... Prayer Works!!! It is fall break around here. We spent the first day doing therapy and getting stitches. Yes I said stitches! I opened my sons bandage this morning and it looked bad! Last night with all of the blood it didn't look gaping. 3 stitches later, a couple steri-strips, and a finger splint and we were all better! What a champ! Makenzie had an alright day but seems to be feeling under the weather. She stood well in her stander and had a good therapy session. She ate decently but our last feed she cried. She took about 3 bites, every time the food hit the back of her throat she would jump. After that every time I put the spoon to her mouth she gave me the pouty face and teared up. Zach complained of a headache and a sore throat and I wouldn't be surprised if Makenzie feels the same way. This would explain her jump at the swallow and the tears! I am pretty sure that we will be heading back to the doctors in the morning! Pray it is something abx can take care of! I gave Makenzie some Motrin, zofran, watered down her formula a bit and put her to bed at 5:30pm because she was so cranky and just miserable. She fell right to sleep. That is were I need to be as there is a large possibility that my night could be long. I sure hope not. Once again please pray for health and restoration! Do you ever feel like your life is spinning out of control? That is where I am right now! It is nothing big bad and awful just all of the little things, new things, and things I have no control over that have me spinning!!! I think what sparked this feeling is Makenzie eating! I am ecstatic that she is, but man did it ever add a ton to my plate!! I heard back from the GI doctor and he had some REALLY great input! A lot of good input... maybe too much! LOL! Not really, but it is a lot to think about and implement! I still have a ton of questions but we are on track and I am so hopeful! So add three to four 30 minute feedings on top of two and a half hours of therapy and two and a half hours of school, plus her stander, stretching and just time to be a kid and well .... get the point? So worth every minute! I have been on the search for a good feeding therapist for a long time and now Makenzie NEEDS one NOW!!! We had a great OT that worked on feeding about a year ago but her availability was such that she could not continue to see Makenzie. I have contacted her again in hopes that we could make a time work and it is looking hopeful!! Please pray for this. Makenzie loved her and she loved and understood Makenzie. So whether this is the answer or whether God opens a different door pray that something will work out! After a crazy afternoon my oldest decided to cut his finger open! Ok, so of course he didn't do it on purpose but after much deliberation and a call to the doctor it was decided that he would be fine until the morning when they could look at it in the office! I hope I made the right choice. Hard call! Never ending! All is quiet in my house so I think I will head to bed so that I can have the strength to do it all over again tomorrow! Keep praying! One of my favorite restaurants is The Cheese Cake Factory. I remember taking a break and going there while Makenzie was in the hospital . Comfort food. Today Makenzie ate almost a full piece of cheesecake! On top of about on ounce of avocado and squash! Thank You Jesus! I was talking to a friend of mine a few days ago about the chance hood of talking to another family about something completely unrelated to eating and having him mention this GI doctor and how much hope it gave me. On the flip side how unsure I was that Makenzie's journey towards eating would turn out like his child's. She set me on the straight and narrow reminding me that the chance in all of this was God! God controls all of this and he has placed the right people in my life, at the right time for reasons that I may not understand. So as much uncertainty as there is around wether or not now is the time for Makenzie to begin her journey towards getting rid of her feeding tube, pump, extensions, syringes, and formula, I know that God has a plan. What that is I do not know. For me that is torture but I have peace that one way or the other something wonderful will come out of all of this! I have done a lot of reminiscing about the past two plus years. Despite the fact that Makenzie is not talking, walking, and eating she has come SOOOO far from the days of sleepless nights, constant crying, countless medications, and lack of any level of movement or awareness! We are still here! We are still fighting with and for Makenzie! Keep fighting with us by continuing to pray for God's healing over Makenzie! He listens and answers! BELIEVE!! Well Makenzie has another great day! She walked in her gait trainer both at home and at school for the first time since July! God is so good! She ate like a champ! I got about 2 oz in her between home and school today! That may seem like a small amount but for Makenzie it is HUGE!! She is doing great in her stander and sleeping well. She did throw up a few minutes ago which she hasn't done for a REALLY long time, Not sure what that is about but I trust in God's healing of her gut that we have seen over the last couple of months. Just a fluke! Maybe something to do with the food in her stomach, as she is not used to having food in there and only elemental (pre digested) formula straight into her intestines! I am tired tonight so I am going to leave you with some pictures from today and head to bed! Please keep praying!!! Miracles happen everyday!!! LOOK.... Makenzie finished all of the food I made for her today!!! Zach and Makenzie played cars today!!! Zach thought of and set this up all by himeself! What a great kid!!! Makenzie pushing the ambulance all by herself!!! More standing on the wall ladder! "Even now my witness is in heaven; my advocate is on high." There are days when it seems that much in life is stacked up against us and we become overwhelmed. When we are having days like that, help us to remember, Lord, that you are our witness in heaven-you have seen all we face and not one tear we have shed has gone unnoticed by you. But even greater than this is the fact that you are our advocate. We thank you that you are for us and that our hope is in you. Help us to remember all the great things you have done on our behalf. Thank you especially for all the progress Makenzie has made and that you are watching over her. We praise you for all the great things you have in store for us in days to come. Today is a day that I just want to shout from the rooftop at what a great day we had! This post is going to be very picture and video heavy because it shows Makenzie's progress better then works could ever describe!!! We started our day out with speech. Makenzie has not really used her talker for over a month! I was so excited to see her use it again and she didn't seem to skip a beat! She knew just what to do and her therapist had programed it with some of the things that Makenzie and I did in CA. I sure hope her talker comes soon!! She NEEDS it so bad! Here is video of Makenzie telling me that she went to Disneyland with Blake and Joey and that the Matterhorn was her favorite! Then we moved onto PT. Makenies it bearing weight SOOOO well!!! It is almost like the last 3 months of struggle with this never happened!!! WOW!!! She was standing up on the wall ladder with very little support and at one point her therapist let go and she just stood there! AMAZING!!! She stood while holding onto her kae walker! She also did a great job of putting weight through her shoulders and arms!!! Then she had a treat of Ice cream. She held it and put it to her mouth! What a treat for mommy and Makenzie!! Since we had such a great PT session we worked on eating in OT. Makenzie did awesome!!! The next miracle from the last couple of days is.... after I sent the GI doctor in LA an e-mail asking for his help weaning Makenzie from her tube...yesterday, he responded in less then 3 hours!!! He sent a return e mail with some questions and wants a video of Makenzie eating. I am so excited! So today was spent recording Makenzie eating! 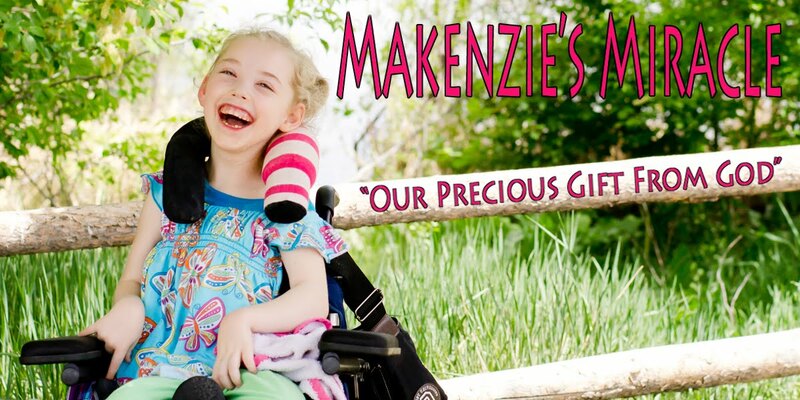 Here is a very short piece for you to see how Makenzie is doing! Then we were off to school. After choice time is was snack time and again she ate GREAT!!! Then it was time for goodbye circle time. As I have said before Makenzie has been doing SO well with sitting. Today in circle she sat for about 2 min all by herself with no prompts!! She sat with a few prompts here and there for over 10 min! Makenzie, Makenzie, oh how proud your mommy is of you!!! After school Makenzie played in her stander for about 45 min. Then it was off to bed. To end the day on a PERFECT note... Makenzie put herself to sleep tonight without a single tear!!!! WOW!! TODAY WAS AMAZING!! THANK YOU JESUS!!! YOU ARE SO FAITHFUL TO THIS FAMILY!!! Keep praying!!! Today is proof that God hears and answers!!! Believe!!! We thank you that you work in us to act according to your good purposes. We pray, Lord, that we would be sensitive to your leading in our lives. We also pray that all those who are involved with Makenzie will act according to your purposes. We pray that all those who are involved with her would walk in supernatural revelation and creativity from you so they can effectively do what is best for her. We also pray that you would visit Makenzie with your anointing to help her overcome every obstacle that she needs to overcome. We pray that she would have new ability to understand, receive, and respond to your love. We have gone once again from shorts to coats in 24 hours. I love having four seasons and I really do love snow but sitting outside for 10 min for a fire drill in the cold is not my idea of fun. Yes that is what we did today during preschool! Makenzie also had a great time painting with a brush, playing with blocks, reading her favorite scary monster story, singing songs, and playing catch with one of her friends! It was ...other then standing in the cold..a REALLY good day at school! 2 more of her teachers that had not seen her since we got back from CA, were in today. They were both amazed at how good she looked and pointed out many things they felt had improved! YEAH GOD!!! I can't wait to go back to CA!!! NAPA ROCKS! After school Makenzie stood for over an hour in her stander. She is doing so well! Zach hung out with her for a while and played blocks while I cleaned up a bit! Makenzie thought knocking the blocks off of the box onto the floor was so much fun. We had our every other month visit from our nurse. I just love all of the paperwork that the state wants filled out! So much fun! Makenzie is fast asleep getting ready for another day of therapy and school! The boys should be asleep by now after "sneaking" their homework up to bed. Naughty boys! They REALLY think I don't know what they are doing up there! News Flash... I do! I just love those kids! Makenzie is doing SOOO well! Every day brings something new! I can't wait to see what tomorrow brings! Pray with me! Believe.... Prayer Works!!! Monday night football rocks! Especially when your team is playing and they play an awesome game starting out the season 6 and 0! I am not a die hard football fan but I do like to watch the Broncos. I have thought a bit in the past how I came to like football. The answer is my dad! I have wonderful memories of watching football every Sunday as a family. We kinda watched while my mom switched between reading the ads in the Sunday paper and taking a nap. I can hear my dad rooting on the Broncos. I can vividly see the excitement on his face when they made a big play. I remember going out in the yard at halftime to play catch. GOOD TIMES! So to this day I still love football and this time it is my choice! Tonight Makenzie had plans other then letting me sit down and watch the game. She was a pill and didn't want to give into dream land. At one point one of the boys came up to inform me that "the Broncos were down by 3"!!! Love it!!!! I hope that I am building those types of memories for my kids! In the craziness of this life that we live. In the midst of the therapy, tubes, doctor appointments, medicine, trips, school, homework, housework, etc... I want my kids to have that! I know there are some events that they do but I want the random stuff like hanging out watching football too! I worry about this EVERY day! I do the best that I can. I know that I do a good job but sometimes... a lot of times... I still worry! I know that I am not alone in this worry. Makenzie did well today! She was very happy! She continues to do well in her stander and is tolerating it for about an hour or so. So good for those bones and hips! Yeah Makenzie! Mommy is sooo proud of you! The boys caught a huge snake today by the creek down the street from our house. They were were soooo proud! Oh Boys!!! I love my dirty snake loving little boys soooo much! Not so much in love with the snakes though!!! Lots to do tomorrow! Pray for health and healing! Pray for good memories!!! Believe!